Do you have a MacBook with a damaged keyboard? Do you have a MacBook with a broken screen? Does your MacBook not turn on when you press the power button? Does your MacBook not show a light in the jack or a dim green light? If you answered yes to any of those questions we can help. We are Doubleclickittofixit.com. At Doubleclickittofixit.com we offer a wide range of services from software repair, hardware repair, office upgrades, web design, SEO services, and much more. We have been in business in the Chattanooga area for a number of years just down the road from Hamilton Place Mall. We have a number of local businesses just like yours that have used us for the simplest repairs to complete office upgrades. We also offer electrical repair services to repair component level issues on all kinds of Apple MacBook and iMac computers including Apple support for such issues as MacBook Pro water damage, MacBook Pro screen replacement, MacBook Pro keyboard replacement, MacBook Pro hard drive replacement, and MacBook dim green light fixes. What Apple repairs or Apple service do we do regularly? 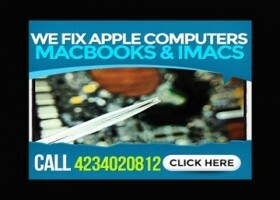 • We do Apple screen repairs. 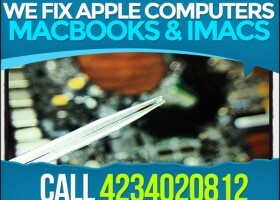 • We do Apple hard drive repairs. • We do Apple keyboard repairs. • We do Apple water damage repairs. • We do iMac hard drive replacements. • We do iMac hard drive upgrades. • We do iMac OSx upgrades. • We do MacBook Pro hard drive repairs. • We do MacBook Pro keyboard repairs. 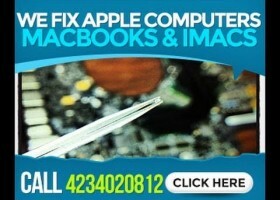 • We do MacBook Pro water damage repairs. Other brands we work with include HP, Dell, Sony, Lenovo, Acer, and many more.